A janitor at a government research facility unwittingly jump-starts a zombie takeover, and it’s up to three slacker boy scouts and a stripper to save the world, or just stay alive. The production value was good. The pacing was good at the beginning but fell apart at times. The comedy was also inconsistent. I laughed a few times, but it was nowhere near as funny as Shaun of the Dead or Zombieland. Bottom line is that this type of movie has been done numerous times before. If you’re going to do it, go big or go home. Bring in a new twist or give it an edge that will push the envelope beyond what’s already out there. 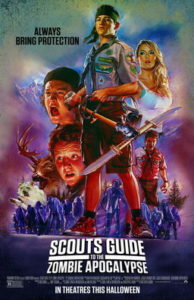 I thought having the main characters be boy scouts would be a nice twist, but it only delivered on that front part of the time. It had a couple of good moments, but nothing to make it stand out as a horror comedy for the new generation. Damn millenials.